Although Norfolk has such a fine collection of magnificent churches, there are few with very large organs. The exceptions are Norwich Cathedral, which is the second largest cathedral organ in the country (after Liverpool) and Cromer. There are, however, a great number of historic small organs. Many of these are chamber organs which came either from the local big house or from elsewhere. Similarly, when richer churches replaced organs, the old instruments found their way to country parishes. Important examples are the Snetzlers at Hillingdon and Sculthorpe and the G.P. England at Cawston. Organs which are not in their original homes occur in an enormous number of Norfolk churches (over 150), with a recent increase in transplants due to redundancies either in or out of the county. From the nineteenth century, Norfolk has a very fine collection of organs by G.M. Holdich, who was one of the last to work in the old fashioned English style. Redenhall is the finest surviving Holdich organ in the country. James Corps maintained a factory in Norwich from at least 1850 until 1864, but had other addresses in Reading and London. Mark Noble, senior and junior, built organs in Norwich in the 1850s and 60s. Their instruments are fine examples of the early Victorian style (somewhat like those of Holdich) and often have handsome cases. The prices charged by the more fashionable Victorian builders (Hill, Walker, Willis, Lewis) were out of the range of many parishes, and most of the organs by these builders came into the county from elsewhere. There are a great number of organs by lesser, but worthy builders, such as Bevington, who produced a range of small organs which sold all over the world. Similarly, Henry Jones of London built sturdy instruments. Thomas Jones (no relation) was at the cheaper end of the market but his organs are pleasant enough. Thomas Cassons Positive Organ Company turned out a range of very small organs, sometimes with nice cases, around the turn of the twentieth century. There are about thirty Cassons in Norfolk. Provincial builders such as Forster & Andrews of Hull. Binns of Leeds was a major provincial builder, sparsely represented in Norfolk (but his organ in Haverhill Old Independent, Suffolk is magnificent). His magnum opus in Great Yarmouth Parish Church was destroyed in World War II. Similarly, the few organs in the county by Conacher of Huddersfield were obtained second-hand. Gray & Davison, in their early days, built many important instruments, but failed to keep a grip on the market and for many years until their demise in the early 1970s did mostly minor work. There are a number of their organs in Norfolk. The Andrew Carnegie Foundation, which matched donations pound for pound, enabled many parishes to acquire organs. A number of builders in the twentieth century produced standardised Model Organs. Such included the Compton Miniatura, the Walker Model and the Cousans (Lincoln) Premier. There are one or two in the county, but by this time most Norfolk churches were too strapped for cash to afford brand new organs. The dominant builder in Norfolk was Norman & Beard. Founded in Diss by E.W. Norman in 1870, Norwich, the firm later moved to Norwich and grew to be one of the largest in the country (the factory even had its own railway siding). The building is still standing (corner of St. Stephens and Chapelfield Road). Norman & Beard amalgamated with Hill of London in 1916, moved into Hills factory in London and continued trading until a few years ago. They held such sway that other big firms scarcely got a look-in in Norfolk (Willis, Harrison & Harrison, Rushworth & Dreaper, Compton  Walkers had a Royal connection and therefore picked up a few jobs, notably round Sandringham). One or two Norman & Beard men set up for themselves when the firm moved to London, notably W.N. Middleton, H.F. Betts and Nicholls & Fitt. Perhaps the most interesting aspect of Norfolk organ-building is the small firms, often one man outfits, which built a few instruments, sometimes as a sideline to other activities. These included James Scott of West Tofts (surely encouraged by the Revd. Augustus Sutton), Benjamin Collins of Lamas and John Bullen of Diss. William Christmas Mack of Great Yarmouth supplied a number of small organs in East Anglia, but may have acted merely as an agent. Similarly, Godball of Ipswich kept a music shop in the Cornmarket and supplied organs which he obtained to order. Glasspool was organist of Wymondham Abbey, ran a music shop with his brother and did a little organ work, sometimes styling himself The Abbey Organ Works. George Paddy Benson was storekeeper at Norman & Beard, but made up organs from parts of old ones, sometimes for Norman & Beard but occasionally under his own name. He also brewed and sold a peculiarly alcoholic ginger beer. The Revd. George Buck, son of Dr. Zachariah Buck (Organist of Norwich Cathedral) built a few organs out of bits and pieces begged from Norman & Beards factory. Boggis of Diss (now owned by Rodney Briscoe) does good work. In recent years, some distinguished new instruments with good cases have been produced (e.g. Starston). E&W Storr of Neatishead did a lot of restoration/rebuilding for many years and were bought out by Richard Bower, who has earned a good reputation for his work, especially new instruments. Holmes & Swift are another recent local firm who do good work. David Miller of Orwell, Cambridgeshire has described himself as the Steptoe & Son of organ building but has done a good deal of work maintaining and rescuing old instruments. In one or two cases, incompetent (but sometimes well-meaning) persons have carried out disastrous work. 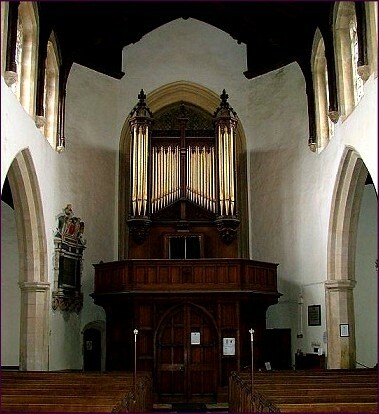 An example was the former organ at Binham Priory (before the present instrument arrived from East Harling). Another was the wonderful organ, ex-West Tofts, at South Pickenham, which suffered a good deal of damage, including spoliation of the case painting. Thankfully, this has been put right. Williamson & Hyatt of Trunch did some good work in the nineteen fifties, later joining up with Cedric Arnold of Thaxted. Their organ at Walsingham (1964) is an outstanding piece of work and came as a surprise for a small provincial builder at the time. East Anglian firms outside Norfolk naturally provided several instruments. Bishop & Son is the oldest organ-builder in the country, with separate establishments in London and Ipswich. Rayson of Ipswich provided a number of organs through more than one generation. Gildersleeves of Bury St. Edmunds was responsible for a few small but pleasant instruments. Cambridge firms such as Miller did surprisingly little work in Norfolk, mostly in nonconformist chapels, one of which (Nordelph Wesleyan) went as an exhibit to the AJF Museum in the old Regal Cinema in Downham Market. Millers rival, Bedwell, did a few jobs in the county. Canon Gordon Paget, onetime Minor Canon of Norwich, Rector of several city churches and later of Hedenham, was for many years an important figure on the county organ scene. He acquired organs for a great many Norfolk churches (thus explaining the presence of a number of instruments by builders not found elsewhere in the county). As a historian, he was prolific, if not always accurate. Ralph Bootman, who is still to the fore, was a teacher who turned his hand to organ work as a hobby. He restored several instruments, has written a good deal, and has played every Anglican organ in the county.